This article engages in the photographical gesture of pointing. It departs from a personal memory made during a bus trip from the city of Hue to the former demilitarized zone of Vietnam. The tour guide on the bus said, “You cannot imagine”. What we, the passengers, could not imagine was the effects of Agent Orange spread during the American War (in the West generally known as the Vietnam War). As we travelled through the landscape the guide pointed at two plastic covered photographs meant to give evidence and provide material for our imaginations. The main focus of the article, however, is set on the Hanoi based artist Nguyen Trinh Thi’s Landscape Series No. 1 from 2013. 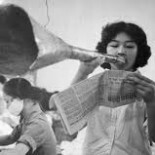 This multimedia series presents Vietnamese press photographs collected from the internet. It addresses an archive of cultural memory while also accentuating the act of pointing at something which is hidden yet present. Nguyen investigates “landscapes as quiet witnesses to history.” When investigating this she comes across uncertainties as well as specificities. The overall shadowing specificity is the repetitive act of pointing. All the images she collects show people using the index finger to indicate something invisible but significant. It comes across as assertive and communicative but reveals little. The pointing gesture seems to suggest that something will always remain elsewhere. Keywords: photography, pointing, gesture, landscape, witness. Anna Rådström has a PhD in Art History and works as a senior lecturer at the Department of Culture and Media Studies, Umeå University, Umeå, Sweden.